A facile wet chemical method has been used to synthesize bifunctional core-shell nanoparticles of Fe3O4@RE(DBM)3·Phen (RE=Eu3+,Tb3+) showing an interesting combination of magnetic and luminescent properties. This method is convenient, cheap, and efficient. The morphology, structure, luminescent, and magnetic properties of the nanoparticles were investigated by X-ray diffraction (XRD), scanning electron microscopy (SEM), transmission electron microscopy (TEM), UV-vis absorption, fluorescence emission, and superconducting quantum interference device magnetometer (SQUID-VSM). The maximum emission peaks of novel Eu3+ and Tb3+ nanocomposites are at 618 nm and at 514 nm, respectively. 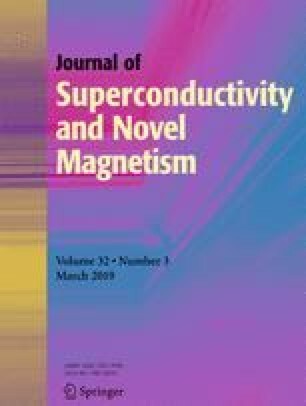 And their corresponding special saturation magnetization Ms. are 25.853 emu/g and 24.015 emu/g, respectively. For the nanoparticles, it is shown that there have better magnetic behavior and they may act as red- and green-emitting material with potential application for fluorescent magnetic particle testing. Moreover, this chemical route could be used to obtain the development of several bifunctional systems of other rare earth ions for practical application. This work was supported by a Science and technology support project of the General Administration of Quality Supervision, Inspection and Quarantine of the People’s Republic of China (No. 2017QK165), Science and technology support project of the Anhui Bureau of Quality and Technical Supervision (No. 13zj370022 and No. 2018AHQT23), AVIC Institute of Fundamental Technology Innovation Fund (Grant No. JCY2015A001), Fundamental Research Funds for the Central Universities (No. JZ2015HGCH0150).